Help to improve volume of hair and strengthen the hair roots. Helps hair from premature greying. Jovees Regrowth & Revitalising ready to use revitalizing hair pack will stimulate hair growth while helping hair from premature greying. It will add luster and sheen to hair. It will work as an excellent conditioner that will help improve volume of hair and strengthen the hair roots. Apply all over the scalp hair and leave on for 45 minutes. Wash thoroughly with plain water. 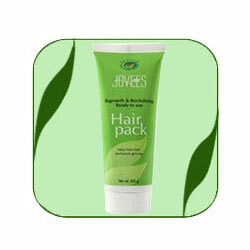 Use Jovees Henna and Ginseng Shampoo next day for washing the hair.